The preparatory exercise is to use a viewing frame of 5 x 5 cm and select areas from images where the shapes are interesting and to record these on paper. 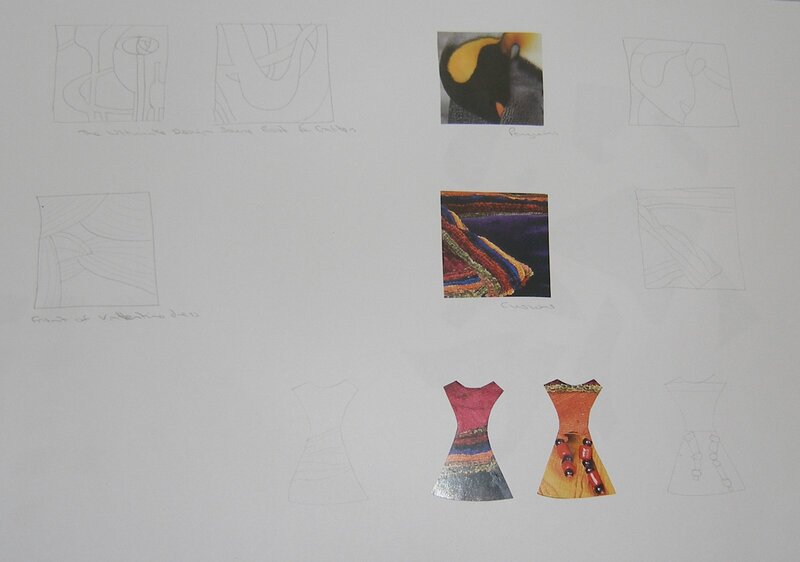 The left hand drawings below are quite faint but were parts of pictures from a design source book, and a postcard of a Valentino dress. The colour images on the right I cut from magazines and then drew in pencil and I also tried using a simple dress shape to see how that changed the shapes within. Taking the top right image from above, the penguin, I then isolated the different elements of the image: texture, colours and shapes. The textures were quite simple, short pencil strokes for the fur but there was also a change in texture where the fur made small circular shapes. Colours were a surprising range for such a small image and it was interesting to isolate these. 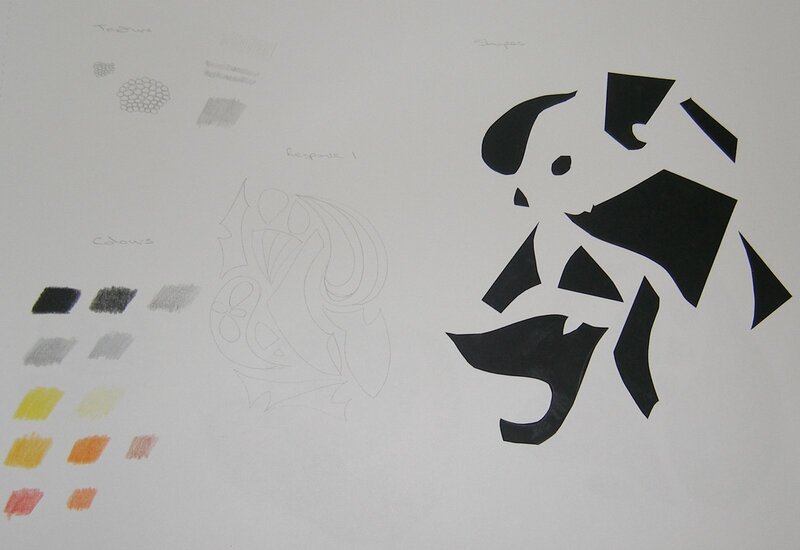 For the shapes I enlarged the image and cut the shapes out of black paper. For a drawing focussing on one aspect of the image I decided to concentrate on the shapes so I did a pencil drawing repeating some of the shapes and rearranging them, this is in the centre of the above photo. I simplified the pencil drawing that I had done and then I did colour versions in pencil, gouache and paper collage as seen below. For the gouache version I also picked up the colours from the original image but for the other two I focussed on the shapes only. I struggled with this exercise which was to draw from real objects. I tried a number of groupings of different items but just couldn’t get inspired to draw them! In the end I chose a selection of shells because of the interesting shapes and because I thought the limited colour palette would provide it’s own challenge. I did four studies of the shells. 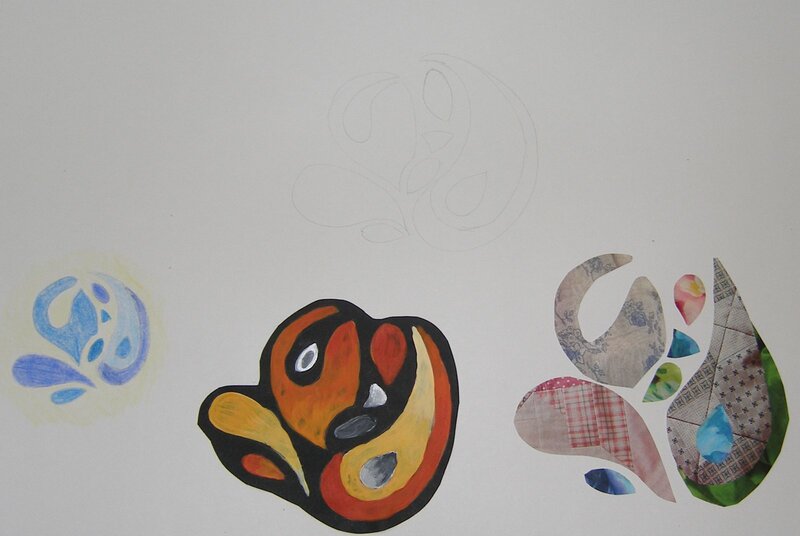 Top left is paper collage with a fringe of paper representing one of the shaped shell edges. 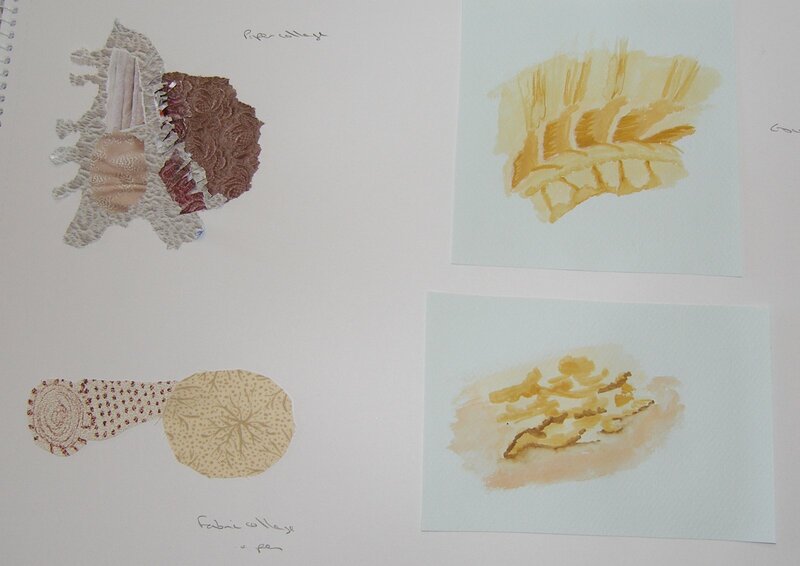 Bottom left is a fabric collage, with pen marks on top of the fabric; these two collages focussed on the shapes of the shells. Then I did two gouache paintings on the right which were intended to focus on the colours, isolating small sections of the shells and trying to get the shading and depth.